Jim Channell studies the record of the ancient geomagnetic field in rocks and sediments. Such studies impact a wide range of the Earth Sciences. “Fossil” (remnant) magnetism in rocks and sediments can be used to document the past position of rock bodies, from whole continents to continental fragments in mountain belts. In the last 25 years, Channell has used “paleomagnetic” methods to reconstruct the past position of continents and continental fragments in the Mediterranean region; based on records of the ancient geomagnetic field in rocks from throughout the Alpine mountain belts, from southern Italy to eastern Turkey. Polarity reversals of the geomagnetic field are globally synchronous and can be recorded by rocks and sediments. For this reason, the record of geomagnetic polarity reversals in sediments and sedimentary rocks is the preferred means of global stratigraphic correlation, and is central to the construction of geologic time scales. Channell has been prominent in the correlation of fossil events to the polarity record of the geomagnetic field, particularly in the Late Mesozoic Era. In the last few years, geomagnetic secular (short-term) variation and paleointensity data have been used for high-resolution correlation of “recent” sediments (less than about 2 million years old). Channell has been at the forefront of such studies, which have been accomplished in large part through participation in two cruises of the research vessel Joides Resolution to the high-latitude North Atlantic in 1999 and to the sub-Antarctic South Atlantic in 1997-98. 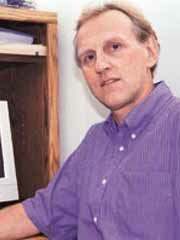 Channell was elected a Fellow of the American Geophysical Union in 1998 and was Distinguished Lecturer for the Joint Oceanographic Institutions for 1998-99.